A new CNN/Opinion Research Corporation poll released yesterday shows Americans are fed up with illegal immigration. 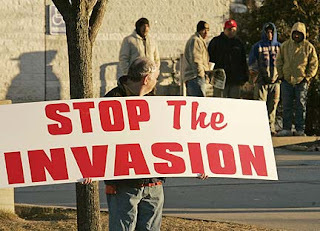 Seventy-three percent want to decrease the number of illegal immigrants in this country. Thirty-seven percent would deport them all. Oh come on! How are Democrats to win any more elections without the votes of illegal aliens? Getting illegals to the polls was supposed to be a major job of ACORN before it went into consulting small businesses on how to properly run a child prostitution enterprise. People are indeed fed up though... And when Obamacare finally fails, look for the lefties to really push this as their next big issue. I'm anti illegal for the reason that they drive down the wages of the legals. The numbers these polls give are almost mind boggling in that they show how apathetic many Americans can be. Who in his right mind, perhaps other than a greedy tobacco farmer or unscrouplus construction company owner that employs illegals, would be in favor of more illegals coming here? The groups I mentioned don't make up 37% of the Country. I don't think there are enough way out there left wingers to make it that high either. The same goes for the deportation question. The world hasn't gone mad. I just think there are about a third of it, those two polls bear this out, that just don't care.